Made from RUBATEX Closed-Cell Neoprene, Spenco Products offer exceptional shock absorption, cushioning, and energy return. The micro-denier suede top cloth reduces friction and is treated with ULTRA-FRESH to inhibit the growth of odour-causing bacteria on the insole. 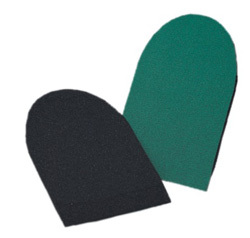 Heel Cushions absorb shock to the heel which relieves Heel Pain.